Back to category: Cantilever Promotional Parasols. Our futuristic Über Brolly Vertical Cantilever Promotional Parasols have a modern and minimalistic straight shaft. This unusual parasol not only looks different but it works in a very unique way too. 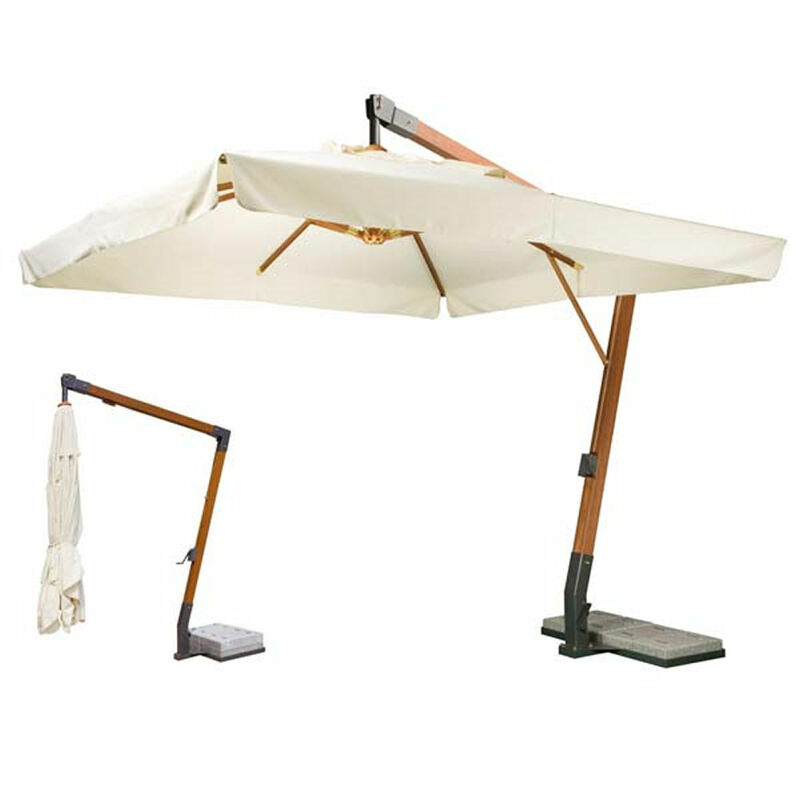 It both opens and closes close to the straight shaft so there is NO need to move anything underneath the parasol such as tables and chairs. This makes these printed parasols highly practical and time saving. This open and close system is also gas sprung making it very lightweight and easy to operate. These luxury and ultra strong cantilever printed parasols come with a NEW straight aluminium shaft, measuring a sturdy 110mm x 76mm, in either an anodized version in Space Grey or carbon coated in dark grey. The ribs with special ash wood finishing for an unalterable design. You will find interchangeable aluminium ribs again in either an anodized version in Space Grey or carbon coated in dark grey measuring 18mm x 30mm. These come with stainless steel screws. Your logo will be printed onto one or more panels or you can choice a more detailed branding option such as an overall print design, printing on all panels or valance printing. Brollies & Parasols are unique as we offer two different options when it comes to your promotional parasols requirements. We have factories both in Italy, the European hub for parasol manufacturing, and in the Far East. Depending on your time frames and your budget we can turn printed parasols around in 3-4 weeks (depending on the time of year) by staying in Europe. Alternatively, if you are looking to save money then our Chinese factory can offer super low prices paired with exceptional quality. The lead times are around 8 – 10 weeks. Potentially reducing these to around 5-6 weeks with express delivery. Contemporary square canopy with 4 panels measuring 3m x 3m with wind cup. High quality 350gr/m2 acrylic treated with a protection covering preventing water absorption and protects from rain, dust and harmful UV radiation. parasol, means that handling is very light and easy.